Yet another kitchen experiment today. I picked up some salmon since it was on sale, and decided I'd do something a little different with it. Plus I had leftover buns from regular ol' chicken sandwiches. The salmon cakes are kinda another sneaky recipe. The salad, well, isn't exactly sneaky, but the husband ate it right up, and he is not a tomato-lover. I always tell the husband that if he were still in the 'old country', they'd have kicked him out for his dislike of tomatoes! Extra bonus...it's a lazy-wife dish! Bake the salmon in the oven for 18 minutes at 350°, or until it flakes easily. Flake the salmon off the skin into a large bowl. 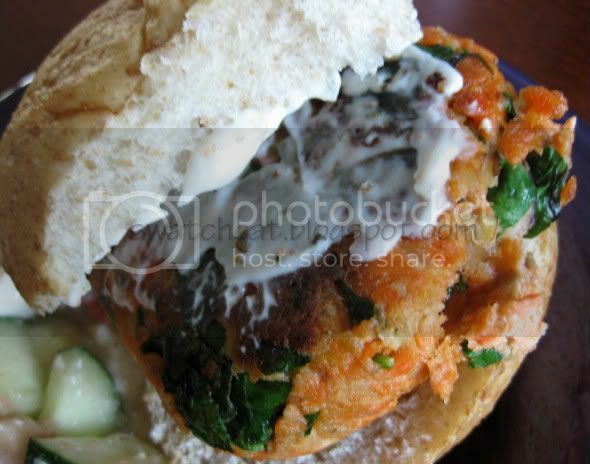 Mix in the spinach, mushrooms, and bread crumbs in with the salmon. Even though it's icky, it really works best to mush everything together with your fingers. Once thoroughly mixed, add in the eggs and mush again with hands. Add in a little garlic/sea salt blend, roughly 1/2 tsp. In a skillet, heat enough canola oil to coat the pan. With the mixture, form into 1 1/2-inch balls and make them as firm as possible. Press into 2-inch cakes and place into the skillet. Cook each cake until a deep golden brown on each side. Serve either on a bun as a burger or alone. Makes 6 cakes. In a large bowl, empty both cans of beans (make sure they're drained), and add the feta crumble. 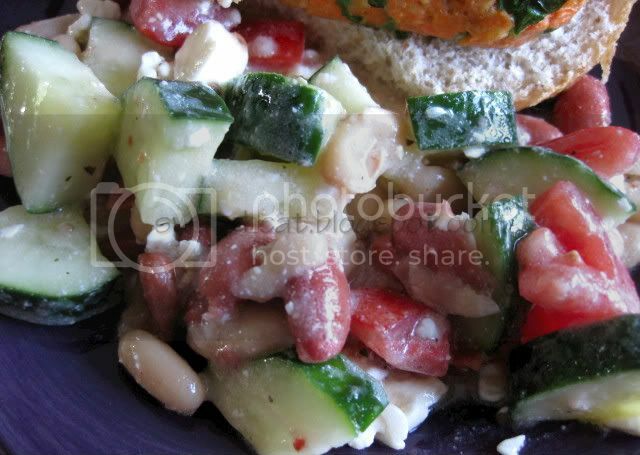 Slice both the tomatoes and cucumber into 1/2-inch slices, and then quarter those slices and add to the beans and feta. Add in both dressings and mix thoroughly. 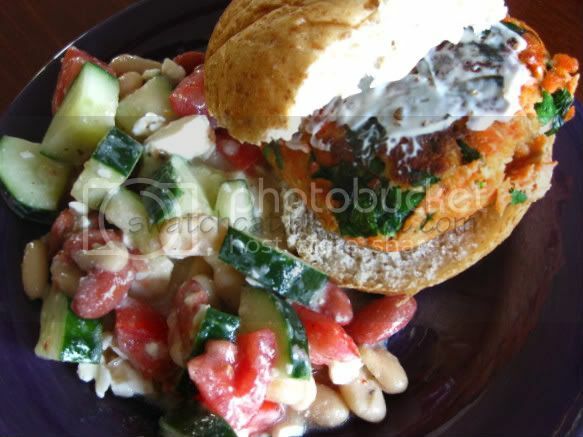 Being Greek, I make something similar to the Mediterranean Bean Salad. Well, it's pretty much a Greek salad...without the lettuce. That's one thing I hate: wilty lettuce. So I just cut up cucumbers, tomatoes, feta cheese (Presidential is the bed brand; not rubbery/ salty, just nice and creamy), and kalamata olives. Add extra virgin olive oil, red wine vinegar, and fresh Greek oregano out of the garden. Ummm...so good! Also, Marie's Dressing line makes a REALLY good Greek vinegarette.